[toc]When you have runny nose, your body reacts positively to the allergy, cold or infections through its natural defenses and thus your symptoms augment. But remember, the proper approach to deal with conditions like this is to allow the symptoms to ease, enhance body’s natural defenses and adopt some very handy and proven natural home remedies. During cold and rainy season, cold, flu, allergies and other such conditions are quite common. 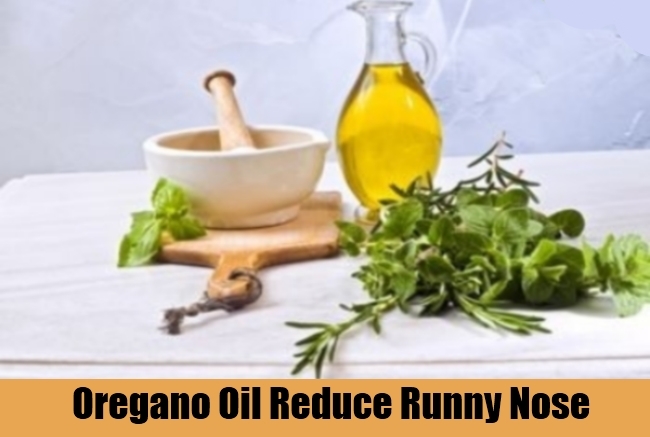 Therefore, whatever may be the reason for the above problems they are often associated with runny nose, thus causing irritation, annoyance and disturbance to the sufferer all the times. You therefore can’t sit ideal and let the problem take a toll on your health and well-being. 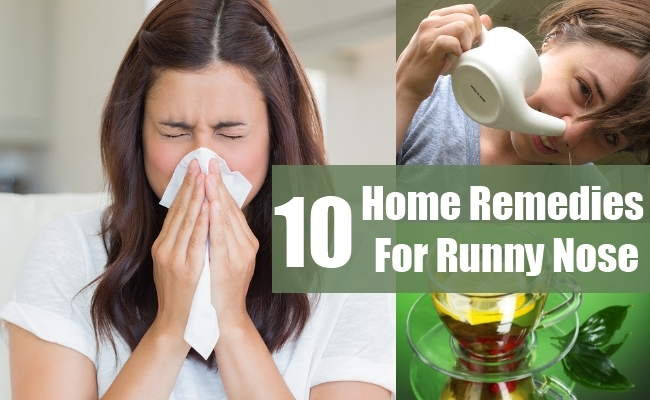 Without letting your problem aggravate and prolong, you can immediately act and adopt some proven home remedies like the ones given below and start feeling better. Application of warm compresses seems a better option as it eases the congestion due to sinus blockage and helps alleviates the sinus pressure to help open the nasal passage. The symptoms like runny nose perpetuate if you do not take care of your habitat properly. For instant, air conditioned rooms aggravate such symptoms. 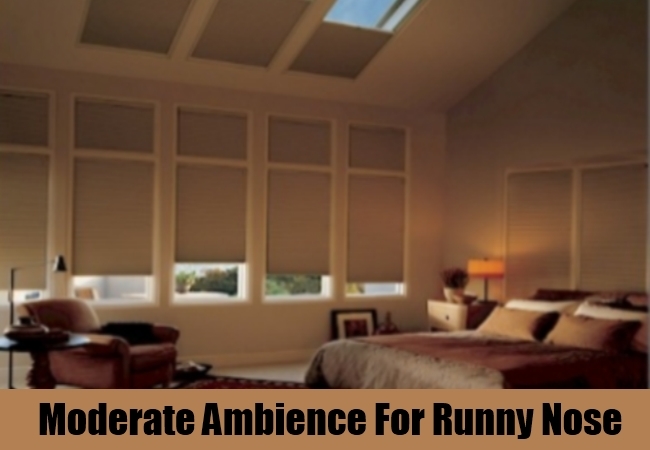 Therefore, prefer staying in rooms with normal temperatures and also avoid fluctuating temperatures. 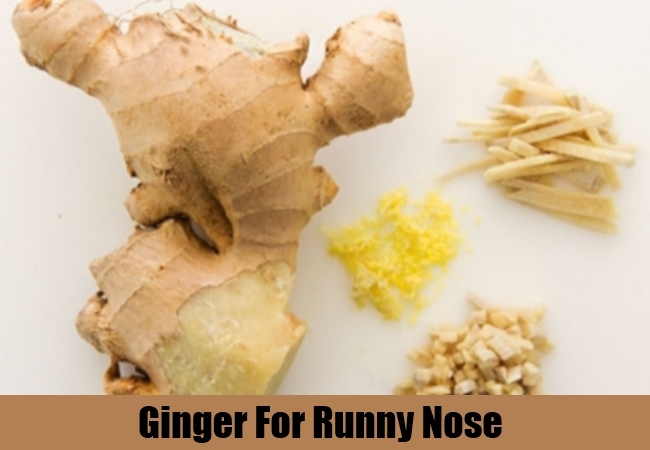 Ginger is a very effective natural herbal remedy for runny nose or any other such symptoms because its natural antimicrobial properties make it one of the most powerful herbs for such treatment. 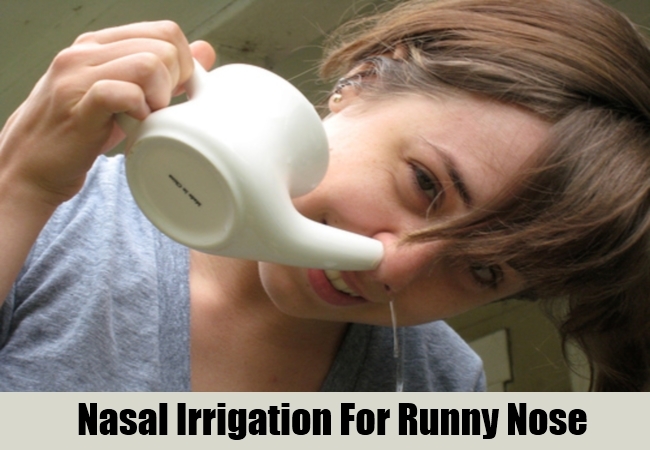 Nasal irrigation with salt water solution is very effective if followed routinely. Prepare salt water solution by dissolving one tablespoonful of salt in one liter of sterile water. Take a neat dropper and fill the solution in it and then drip a few drops gradually into one nostril by tilting your head back and down. After finishing the same procedure in the other nostril, remove excess mucus by blowing your nose. 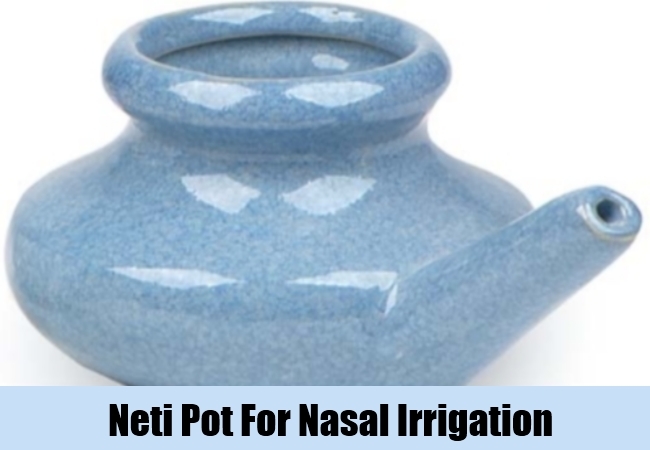 You can use neti pot to irrigate your nasal passages with saline water, but you must ensure that the saline water you are using in the pot is clean and sterile and free from chemicals. You should follow a proper technique for this kind of treatment and if you are unaware of any, then consult with your doctor or else follow this simple method: take the neti pot in your right hand and stand close to a wash basin and move your head forward and then slightly tilt it towards your left shoulder; start pouring saline water into the right nostril from the neti pot and allow the water clean the nasal passages while making its way out of the other nostril. Similarly, you can perform the same procedure for the other nostril as well. This kind of nasal irrigation helps to irrigate, clean and moisten the mucus lining of the sinuses besides releasing the pressure from them. 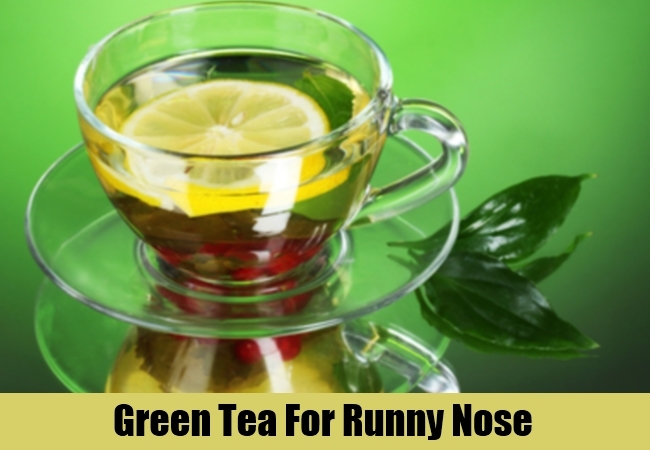 Drinking Herbal tea is a proven home remedy for runny nose because, apart from the aroma and taste, green tea – whether it is made from eldberry, chamomile or any other similar herb – is very effective if it is mixed with ginger or pepper. 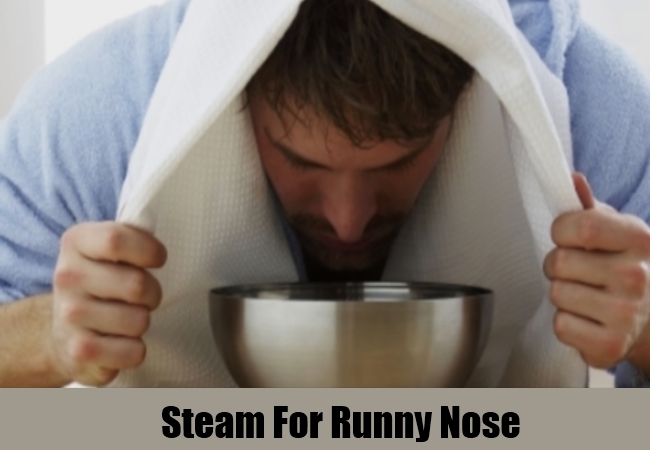 The mucus secretion becomes excessive when the sinus infection or congestion proliferates and the best way to counteract is to breathe in steam from a boiling water trough. Addition of menthol, mint or eucalyptus oil to this water makes it more effective. While breathing in steam ensure that you wrapped yourself with a towel and remain at a distance from the boiling water. Since time immemorial ginger garlic and turmeric are used to treat infections, allergies, nasal congestion, runny nose and several other types of diseases. Among all these herbs, you can use dried turmeric powder along with linseed oil as a mixture and heat it until it smokes. Next, close one of your nostrils with the thumb or index finger and then inhale the smoke through the other nostril and vice versa. 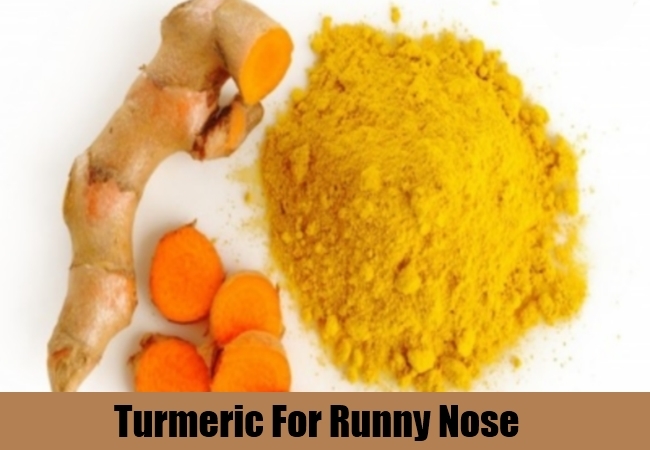 Similarly, you can add turmeric to your food particularly during the episodes of runny nose. Oil of Orengo is just fabulous as it contains copious amounts of anti-microbial and anti-inflammatory compounds capable of shunning the worst kind of bacterial, viral or even fungal infections. You can add a few drops of Oregano oil to an orange juice and drink it regularly until you feel comfortable. Vitamin C rich orange juice with the effectiveness of Oregano provides additional strength to your immune system and thus effectively fights the disease. 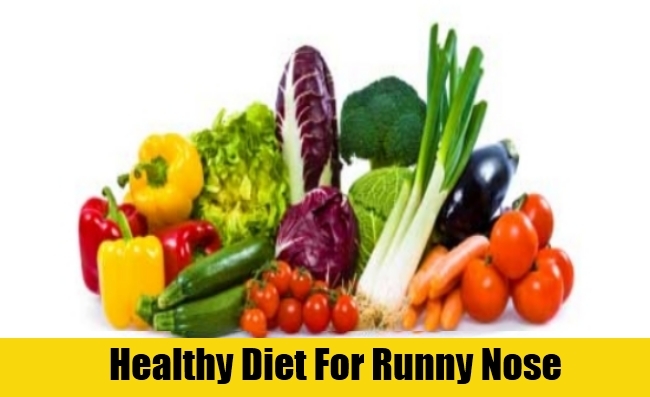 In Conditions particularly like runny nose, you should take a note of what you eat because sometimes the diet you prefer may aggravate the condition or could lead the condition to worst scenarios. The reason, milk-based food products contain excess amount of histamines and therefore are capable of making your condition severe. Similarly, bread, curd and other such products also contains yeast and bacteria capable of augmenting your symptoms and disease. Therefore, include plenty of good food items and fruits rich in vitamins, minerals and antioxidants and drink favorable fruit juices and plenty of water.